COLUMBUS, Ohio – Excessive rain and extensive flooding and ponding have taken a toll on corn fields across Ohio, and could leave some growers facing sudden death of their plants now or diseased crops and potential long-term yield loss later, according to an agronomist in the College of Food, Agricultural, and Environmental Sciences at The Ohio State University. “Plants past the V6 growth stage should survive pretty well,” he said. “Prior to the 6-leaf collar stage, as measured by visible leaf collars, or when the growing point is at or below the soil surface, corn can usually survive only two to four days of flooded conditions. 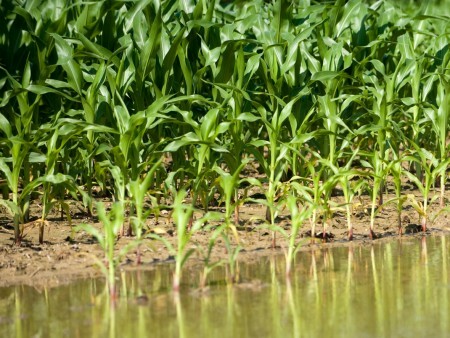 Corn that does survive flooding might face a nitrogen deficiency later, Thomison said. For corn that is emerged, growers should check the color of the growing point after the water recedes to assess the plant’s survival, Thomison said. “It should be white to cream colored, while a darkening and/or softening usually precedes plant death,” he said.